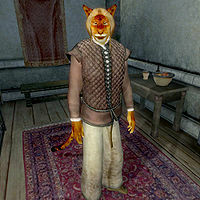 J'bari is a Khajiit rogue and the master trainer in Light Armor. He resides in southeastern Leyawiin and shares his big house with another Khajiit trainer, namely Tsrava. Like the other master trainers, he will provide you with his unique services after completing a task for him. Both Khajiits are quite anti-social as neither of them ever leave the house. They both sleep in the western section of the upstairs area and get out of bed at 6am. After waking up, they head downstairs where they will spend the entire day wandering around on the ground floor, at times exchanging the latest gossip from around town, but nothing else. At 9pm J'bari picks up some food and finds an available seat for a late two-hour dinner. At 11pm he goes back upstairs and finds his bed. He will offer services at all times except when eating or sleeping. He wields a silver dagger and wears a set of common, middle-class attire consisting of a pair of light brown linens, a quilted doublet, and a pair of pigskin shoes. He carries his key and a small amount of gold. He has access to leveled spells from the Rogue Spell List. The citizens of Leyawiin and Tsrava herself will often talk about J'bari's love of dogs and Tsrava's hatred of them despite the fact that no dogs can usually be seen in or around J'bari's house. Other people can be heard talking about making bets with J'bari. You may overhear some citizens ask: "Have you ever made any bets with J'bari? ", "Have you seen how upset Tsrava gets by all the dogs near her house? ", or "Did you hear how upset Tsrava is about all the dogs that J'bari has in his yard?" This will cause others to reply: "He pays his debts, but his love of dogs is just odd. I've heard he leaves meat in his backyard to attract them. ", "He's a bit crazy for dogs, from what I hear. He pays bets on time, though. ", "I've heard the dogs that J'bari keeps drive her crazy. I've also heard she knows a lot about acrobatics. ", or "Tsrava says the sound of J'bari's dogs drives her to distraction. Can't say I blame her." Should you talk to Tsrava, she will confirm her disliking of dogs and mention that meat is being thrown in her yard: "Some clown keeps tossing meat out in my backyard, and it attracts dogs from Necrom to Daggerfall." The two advanced trainers in Light Armor, Luciana Galena and Ahdarji, will point you toward J'bari if you ask them about master training. Luciana will point you toward Leyawiin with the words: "Head to Leyawiin, and find J'bari. He's the one you want to talk to about Light Armor training." Ahdarji will provide you with a similar reference: "Speak with J'bari here in town. He's good with Light Armor; far better than I." After you have been provided with the reference to J'bari, either trainer will provide you with a brief reminder if you ask them about training: "Speak with J'bari in Leyawiin. He can teach you all that you need to know." Asking J'bari about training will have him say: "If you want training from me, you're going to have to get something for me first. I need a new Elven cuirass. Nothing fancy, nothing enchanted. Just a decent piece of armor. You get that for me, and I'll train you. That's the deal." After retrieving the armor he will say: "That looks like the armor I asked for. Well done. That wasn't so hard, was it? And now, if you need training, I'd be ever so happy to provide it.". This page was last modified on 31 October 2015, at 17:33.